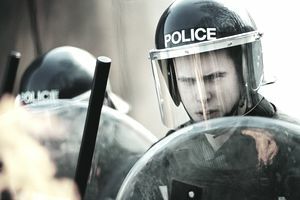 Businesses located in urban areas may suffer property losses due to riots, vandalism or civil commotion. As the following example demonstrates, these perils can cause physical damage to buildings and personal property. They can also generate extra expenses and income losses. Carl owns the Capital Cafe, a restaurant located on Main Street in downtown Cityville. The restaurant building (which Carl owns) and its contents are insured under a commercial property policy that includes business income and extra expense coverages. The policy covers damage caused by any risk not specifically excluded. One evening, several hundred Cityville residents march down Main Street to protest a new tax. The demonstration begins peacefully but a riot breaks out after someone throws a rock through a plate glass window. Rioters begin looting and vandalizing local businesses, including the Capital Cafe. Police are called and the riot is soon quashed. When Carl arrives at the cafe the following morning, the front window has been shattered, the door is damaged, and light fixtures have been ripped off the walls. Broken furniture, smashed glassware, and torn tablecloths litter the dining room floor. Looters have emptied a refrigerator, a freezer, and a liquor storage room. Carl reports the loss to his property insurer and an adjuster arrives to survey the damage. Carl replaces the window, the door, furniture, glassware, food, liquor, and other items stolen or destroyed by the vandals. It is now three days after the riot. Carl is about to reopen the cafe when he learns that the local fire department has closed Main Street for three weeks! Apparently, rioters set fire to a hotel located half a block from the cafe. The building was badly burned and could collapse. Main Street will be closed until the building can be stabilized. Carl wonders whether his property damage and income losses will be covered by his property insurance. Most property policies don't define riot, civil commotion or vandalism. While legal definitions of riot vary, the term typically means a public disturbance involving an act of violence committed by one or more individuals who are part of a group of least three people. To constitute a riot, the individuals must act together to commit (or threaten to commit) violent acts against other people or property. A civil commotion is similar to a riot but it involves more people. It is a revolt by a large gathering of people in a public place. Riot and civil commotion can be difficult to differentiate so the perils are often listed together. Vandalism refers to the intentional destruction of another party's property. Riot, civil commotion, and vandalism are covered perils under virtually all commercial property policies. They are covered causes of loss under both named perils and "all risk" policies. Carl's building and restaurant property are insured under an "all risk" policy. The policy doesn't exclude riot, civil commotion, or vandalism so the damage to his property should be covered. Rioters caused damage to the cafe's window, door and light fixtures. These items are part of the building so they should be covered under the Building coverage included in Carl's policy. The glassware, furniture, tablecloths, food, liquor and other items that were damaged or stolen should qualify for coverage under Carl's Business Personal Property coverage. The damage will be subject to the limits (specific or blanket) and deductibles listed on Carl's policy. Carl's business has suffered a three-day income loss as a result of physical damage to his cafe caused by rioters and vandals. The loss of income should be covered by his business income insurance. Carl may also have incurred some extra costs to get his business up and running quickly. For instance, he may have paid extra money for overnight delivery of food and other supplies to his cafe. These added costs should be covered under Carl's extra expense coverage. The cafe will also lose income due to the street closure ordered by the fire department. Business income insurance normally includes civil authority coverage. The latter covers a loss of income that occurs because access to your premises has been prohibited by a civil authority, such as a fire department. Access must be prohibited due to damage by a covered peril to property not located at your premises. Civil authority insurance covers income lost during a limited period of time, typically four weeks. You can extend this time period by paying an additional premium. Suppose that Carl's restaurant is shut down for three weeks because the fire department has closed Main St. due to the hotel fire. The income Carl loses due to the street closure should be covered by his civil authority insurance. Business income coverage is often subject to a waiting period (a type of deductible). The waiting period applies to income losses, including those insured under civil authority coverage. It does not apply to extra expense losses. A typical waiting period is 72 hours. Business income coverage applies to a loss of income you sustain due to a suspension of your operations during the period of restoration. When a waiting period applies, the period of restoration begins 72 hours after the physical loss. If Carl's business income coverage includes a 72-hour waiting period, he will have no coverage for the income he loses during the three days his business is shut down due to the riot. He will also have no coverage for the income he loses during the first three days of the road closure.